Apple is touting the upcoming iOS 12 as the next major overhaul for the iPhone, but will your phone look any different? Will it slow down? Or will it introduce features that will fix existing problems and head off new ones? At its annual Worldwide Developer Conference, Apple promised faster performance and processing, improved performance, and two major recurring updates: tools to help you limit your time spent looking at your device — or limiting your kids’ screen time — and custom controls and suggestions to help streamline your experience, from tailored Siri commands to an improved editorial recommendations in your News app. QR codes, the square matrix barcodes that lead you to digital content, never caught fire the way they could because users needed to install a third-party app to read them. Users rarely took the extra step. Last year’s iOS11 added a QR code reader in the Camera app, but iOS12 includes a Control Center shortcut so you can finally scan a QR code without taking extra steps. It might be too little, too late, but it’s finally convenient when you need it. First, emoji. With the iPhone X came animoji, which, exactly as it sounds, added animation. With iOS12 comes “memoji,” which you can customize to look like you, or whomever you’d like. Sure, it’s silly, but people love them, and the feature will pop up again. Make your own memoji in the Messages app by selecting the Animoji app icon followed by the “+” sign. FaceTime is getting its most significant update ever, with the addition of group video calls that can accommodate up to 32 people (finally!). You can also start a FaceTime call with members of an existing group text in iMessage. Like other group calling platforms, the screen will focus on the video of the person speaking. The memoji are back: You’ll be able to add effects into your FaceTime call, which will allow you — for no good reason other than that you can — to jump in to your afternoon conference call as a koala. Why not? It’s no secret that Silicon Valley parents often don’t let their kids use the smartphones they invented, or they set limitations on screen time — they know too much about how addicting they’re designed to be. You can also customize Do Not Disturb manually, as you could before, but with some added options. For example, you can set it up to automatically turn off Do Not Disturb when you leave your current location. 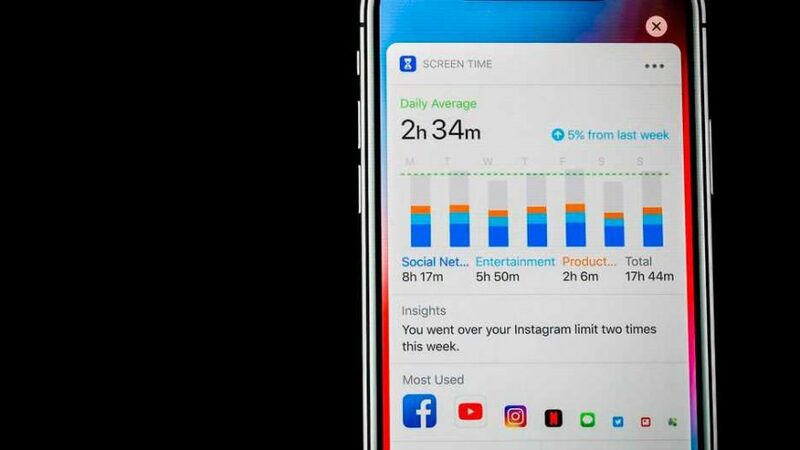 Under Settings > Screen Time, your device will chart you how much time you spend in specific apps or on websites, breaking it down to the minute and providing averages over time, a bit like the Health app. You’ll even be able to see how often you pick up your phone, how many alerts and notifications you receive and how many times you unlock your device — the answer is likely to surprise you. You can customize time limits by app and Screen Time will let you know whether you’re hitting your target. You can also set it up to track and limit how much time your kids are spending on their devices,. Apple is serious about curbing our increasing attachment to our devices. Screen Time will allow you to schedule “downtime” in which only apps you approved are available. If you must use a “grayed out” app, you can enter a password. It doesn’t seem like much, but sometimes the extra step is enough of a deterrent against doing something you don’t need to do. Well, at least we know how QR codes have felt all these years. You’ll be able to program custom commands and actions for Siri, from “order my coffee” to “find my keys,” which could, say, activate Tile and tell you what it learns. It feels odd to be excited about this, but measuring has felt like an obvious addition to the Level app — a handy function you may not need often, but it can save the day when you do. With iOS12, your phone will be able to use its camera to function like a measuring tape, even capable of measuring two- and three-dimensional objects at once. You’ll also be able to search for terms, places and people in your Camera Roll, apply loops to a batch of photos you’d like to display, and receive suggestions on photos to revisit with a “For You” tab. Share a string of photos from a trip to New York with friends, for example, by sharing by place. If the blue dot in Apple Maps has led you astray one too many times, you’ll be glad to know CarPlay will now support third-party map apps.